Often called the ‘Dean of American Storytelling,’ she is today considered one of the world’s foremost storytellers – widely respected as both a master and scholar of the ageless art. She won two Emmy Awards (Citations of Merit) for Tales from Viet Nam and for her series of 30 programs on storytelling, Stories from My House, on educational television, where she created, wrote, produced, and appeared in eight series of literature programs shown on PBS stations throughout the United States. She has also received the prestigious Women’s National Book Association Award for bringing the oral tradition to the American public and recently the Maharishi Award for ‘promoting world harmony wherever she goes by enlivening within the listener that field of pure consciousness that is the source of all stories.’ She has performed her improvisational telling of ancient and modern stories and given talks in collaboration with respected masters of other art forms- especially in the world of poetry and letters (Joseph Campbell, Robert Bly, James Hillman, Nor Hall, and Gary Snyder) throughout the United States, including The New School, The Art Institute of Chicago, The University of California, The Metropolitan Museum of Art, The Whitney Museum, The Museum of Modern Art, The American Museum of Natural History, Il Santuario De Guadalupe in Santa Fe, John Hancock Hall in Boston, the Laurel Theatre in Knoxville, Riverwalk in New Orleans, the 1980 Winter Olympics, the Spoleto Festival, and The Palace of Fine Arts in San Francisco, and many, many other venues. She has also performed in Canada, Britain, Ireland, Italy, Spain, and Greece. 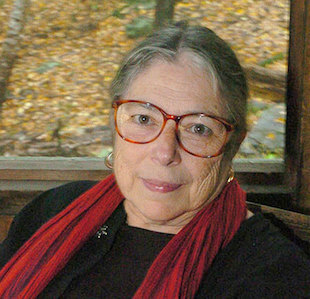 She founded the storytelling at ARTPARK, Lewiston, New York, 1973-1983; one of the first storytelling places for the revival of storytelling, creating a one week residency for storytellers in a famous art setting, at the edge of the Niagara River Gorge. She is one of the founding members of the New York Storytelling Center in New York City. Her most recent book called What Makes A Child Lucky is published by W.W. Norton.